While decorating preferences can vary greatly from one person to the next, a glass top coffee table is one piece that most people can find fitting for their home. From using one of these tables in a modern living room to setting a glass top coffee table in an office with a seating area, these tables can provide the function that you want with a unique style that works perfectly for a variety of decorating styles. One of the most appealing reasons that many people become interested in a glass surface for their coffee table is that it doesn't stand out too much or look bulky when used in their home. This can be great if you have a lot of busy patterns and pieces of furniture already and want your coffee table to look great. The sizes of these coffee table can vary greatly and allow you to choose a table which fits for the design of a room in your home without looking cramped. Glass is known for being very easy to clean, making it a perfect material for placing drinks and snacks on top of. A standard glass cleaner is the ideal solution for removing water marks and other spills, allowing a glass table to be the best choice compared to wood and other materials for coffee tables. Most glass top coffee tables have a small surface underneath that allows you to place a variety of decorations underneath the glass. This can be great for people who want to display photographs or an assortment of figurines that have no other place in a room. 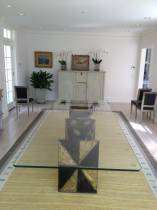 If you've decided that a glass coffee table sounds like a great piece for any room in your home, we urge you to contact us so that we can help you find the best table for your home. Copyright © 2019 Hutchinson Glass & Mirror, Inc. All rights reserved. Website created by National Home & Garden.